It is the metropolitan center of an area whose civilization dates back thousands of years; its Old Town breathes 18th century frontier character; it is transected by the mid-20th century’s most famous road; yet Albuquerque’s modern public persona consists of an iconic image known around the world—colorful hot-air balloons rising in the desert. During events such as the October International Balloon Fiesta, balloons color the landscape like a thousand bright lollipops against the piercing blue Southwest sky. But there are certain to be a dozen or more balloons in the upper Rio Grande Valley on any fine-weather day—of which there are 310 a year—and I’m sure that no matter how often residents and visitors have seen the spectacle, they lift their heads skyward at least once a day to watch. 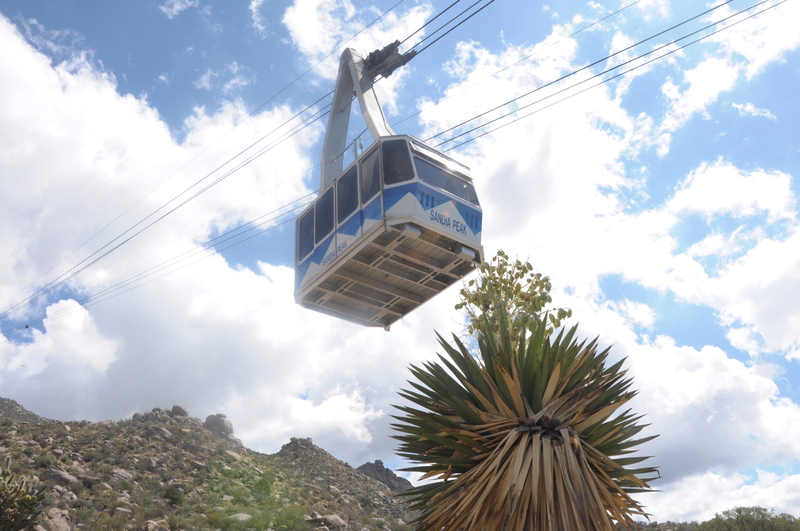 The Sandia Peak Aerial Tramway offers thrilling views. Albuquerque’s is a three-faceted persona. This is a desert city, its canyons and washes holding prickly pear cactus, yellow-flowered rabbitbrush and yucca plants. It’s also a mountain city, situated at more than 5,000 feet at Sandia’s knees, with spicy-scented piñon pines cloaking the foothills. It’s also a valley city, with the Rio Grande rolling southward a quarter-mile east of Old Town. The riverside bosques (woodlands) and ready water were the key reasons the Spanish settled the city in 1706. Back then, Albuquerque and Santa Fe were connected to Mexico City by the Camino Real de Tierra Adentro (the Royal Road of the Interior Lands). When the Santa Fe Trail brought American adventurers to the Southwest a century later, the riverside village began to acquire its identity as a crossroads. In the mid-20th century that image peaked when Route 66 powered its way into the city—and the American imagination—and the “mother road” was featured in books, movies and TV shows. Adventurous motorists made pilgrimages across the United States to get their kicks along Route 66, and Albuquerque, the first big city for hundreds of miles in either direction, was a key way station. Neon signs guided travelers to motels and diners along Central Avenue. 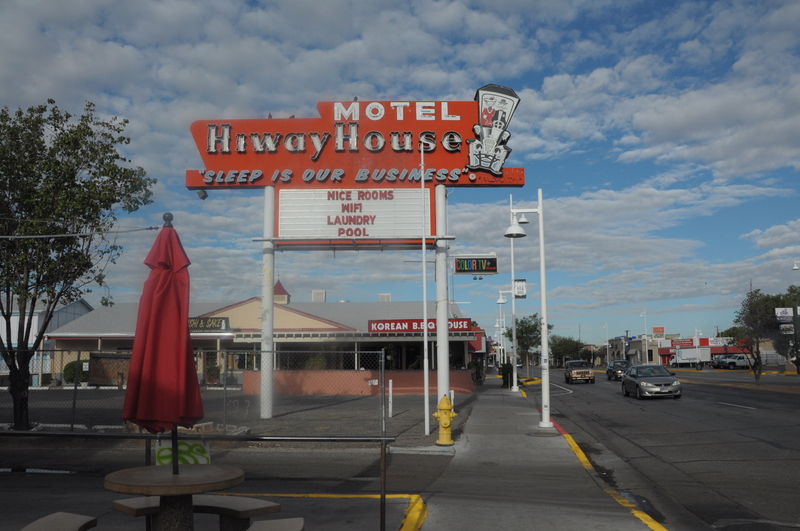 Albuquerque remains a key way station on historic Route 66 as the only large city for hundreds of miles in either direction. Albuquerque is also one of America’s high-tech capitals. Born during World War II, Sandia National Laboratories, located east of Albuquerque International Sunport (the city’s airport), is a leading energy-research center: solar, naturally, but also nuclear, especially fusion, reflecting the lab’s wartime heritage. Albuquerque is also a software center—it was here, in 1975, that Bill Gates and Paul Allen began what became Microsoft, before moving back to the Seattle area four years later. Nearby, galleries such as Andrews Pueblo Pottery offer high-quality Southwest Native American pottery and jewelry, as well as certified pre-Columbian objects. Albuquerque is packed with things you won’t find anywhere else. A few yards away, inside the hugely popular American International Rattlesnake Museum, learn more about these Southwest creatures than one would ever expect to know. At the National Hispanic Cultural Center, modern New Mexico artists such as Gustavo Victor Goler demonstrate the marvelous vitality of 21st century interpretations of ancient Southwest art forms such as santos (carvings and paintings of saints). His Our Lady of Guadalupe features its subject standing astride a crescent moon, surrounded by shafts of starlight. North of the city, at the Indian Pueblo Cultural Center, treasures from 19 individual pueblos include Maria Martinez’s famous San Ildefonso bowls, whose earthy matte-on-glossy black finishes glisten with seemingly infinite depth. Perched at about 7,000 feet along the foothills of the Sangre de Cristo Mountains, Santa Fe has graceful adobe buildings—municipal code requires that new construction adhere to Southwest style—that house museums, inns, restaurants and galleries all focused on history, art and Southwest culture. Palace of the Governors: The 1610 territorial seat of government now hosts the New Mexico History Museum, whose halls chronicle pre-Columbian indigenous civilization, Hispanic settlement and the 1672 Native revolt that New Mexico calls the “first American revolution,” as well as the region’s transformation into a premier cultural and travel destination. The museum’s hall of Southwest retablos, bultos and crucifijos (ecclesiastical artworks) is a stunning testament to the centuries-old vigor of this still-thriving art form. The building’s famous portico fronting Santa Fe Plaza has for 300 years been the home of an Indian Market whose vendors offer jewelry, pottery, blankets and more. Georgia O’Keeffe Museum: New Mexico’s most famous resident was enchanted by the Land of Enchantment early in the 20th century and lived in the area until her death in 1986. The museum devoted to her work opened in 1997 and holds 1,149 O’Keeffe pieces, as well as works by contemporaries such as Thomas Hart Benton, Edward Hopper, Marsden Hartley and, of course, photographer Alfred Stieglitz, O’Keeffe’s celebrated husband. Canyon Road: One of America’s best-known art thoroughfares wends through the hillside just east of the city center, holding dozens of art galleries, boutiques and cafes. Here you can occasionally still find works by the famous New Mexico artists who turned the state’s powerful landscapes into a distinct school of art—including Peter Hurd, Ernest Blumenschein, R.C. Gorman, Nicolai Fechin and more. City Center: Santa Fe visitors enjoy strolling the city’s historic center to discover dozens of shops and galleries, cafes and vendors proffering everything from homemade tamales and local chile powder to handmade santos and turquoise jewelry. For more information, visit santafe.org. 2 comments on "Destination Albuquerque: Southwestern style mingles easily with high-tech culture in New Mexico"
I am an editor of the Newsletter called ” Voice in the Wilderness”, bimonthly magazine published for the Korean Community and korean churches in Albuquerque New Mexico. One of the main news item for November issue will be the Alaska Airlines’ Nonstop Daily Flights to Albuquerque. In the news article, I am wondering if I could use a photo that was appeared on the Alaska Airlines blog which was posted by Alaska Airlines Magazine . I hope you will give us a permission to use photos of the article ” Destination Albuquerque..” This wonderful image will make the Alaskan Airlines new flights News more attractive. Hi Kyong – the image of the balloons is actually a stock image, so we don’t have the rights to share it. However, any of the other photographs in the article were taken by Alaska Airlines staff and you are more than welcome to use them. Just not the balloons.